See in Glossary pipeline. Whenever a source Asset like a .psd or an .fbx file is modified, Unity detects the change and automatically re-imports it. The imported data from the file is subsequently stored by Unity in an internal format. This arrangement is designed to make the workflow as efficient and flexible as possible for an individual user. However, when working in a team, you may find that other users might keep making changes to Assets, all of which must be imported. Furthermore, Assets must be reimported when you switch between desktop and mobile build target platforms. The switch can therefore take a long time for large projects. Caching the imported Assets data on the Cache Server drastically reduces the time it takes to import Assets. See in Glossary must be set up as a service on the server. The Cache Server can be safely killed and restarted at any time, since it uses atomic file operations. Two Cache Server processes are started by default. The legacy Cache Server works with versions of Unity prior to version 5.0. 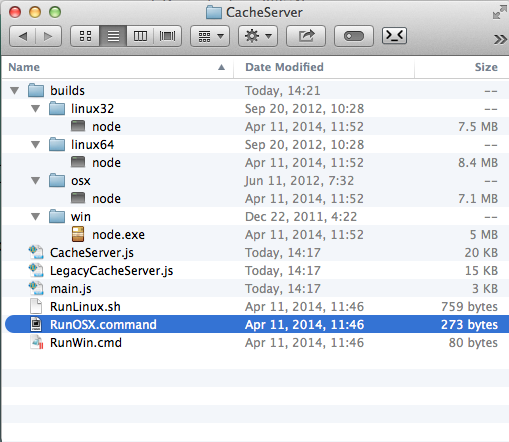 The new Cache Server works with versions of Unity from 5.0 and up. See Cache Server configuration, below for details on configuring, enabling, and disabling the two different Cache Servers. Use --port to specify the server port. This only applies to the new Cache Server. The default value is 8126. Use --path to specify the path of the cache location. This only applies to the new Cache Server. The default value is ./cache5.0. Use --legacypath to specify the path of the cache location. This only applies to the legacy Cache Server. The default value is ./cache. Use --size to specify the maximum cache size in bytes for both Cache Servers. Files that have not been used recently are automatically discarded when the cache size is exceeded. Use --nolegacy to stop the legacy Cache Server starting. Otherwise, the legacy Cache Server is started on port 8125. For best performance there must be enough RAM to hold an entire imported project folder. In addition, it is best to have a computer with a fast hard drive and fast Ethernet connection. The hard drive should also have sufficient free space. On the other hand, the Cache Server has very low CPU usage. See in Glossary is that its cached data can always be rebuilt locally. It is simply a tool for improving performance. For this reason it doesn’t make sense to use a Cache Server over the Internet. If you have a distributed team, you should place a separate Cache Server in each location. The Cache Server runs optimally on a Linux or Mac OS X computer. The Windows file system is not particularly well-optimized for how the Cache Server stores data, and problems with file locking on Windows can cause issues that don’t occur on Linux or Mac OS X. Will the size of my Cache Server database grow indefinitely as more and more resources get imported and stored? The Cache Server removes Assets that have not been used for a period of time automatically (of course if those Assets are needed again, they are re-created on next usage). Does the Cache Server work only with the Asset server? What changes cause the imported file to get regenerated? When Unity is about to import an Asset, it generates an MD5 hash of all source data. If that hash is different from what is stored on the Cache Server, the Asset is reimported. Otherwise the cached version is downloaded. The client Unity Editor only pulls Assets from the server as they are needed - Assets don’t get pushed to each project as they change. How do I work with Asset dependencies? See in Glossary in an .fbx file based on their name or tag. It is also easy to use AssetPostprocessor to introduce dependencies. For example you might use data from a text file next to the Asset to add additional components to the imported GameObjects. This is not supported in the Cache Server. If you want to use the Cache Server, you have to remove dependency on other Assets in the project folder. Since the Cache Server doesn’t know anything about the dependency in your postprocessor, it does not know that anything has changed, and thus uses an old cached version of the Asset. The source Asset itself, or any data generated from it passed to you in the Asset postprocessor. Are there any issues when working with Materials? Are there any Asset types which are not cached by the server?